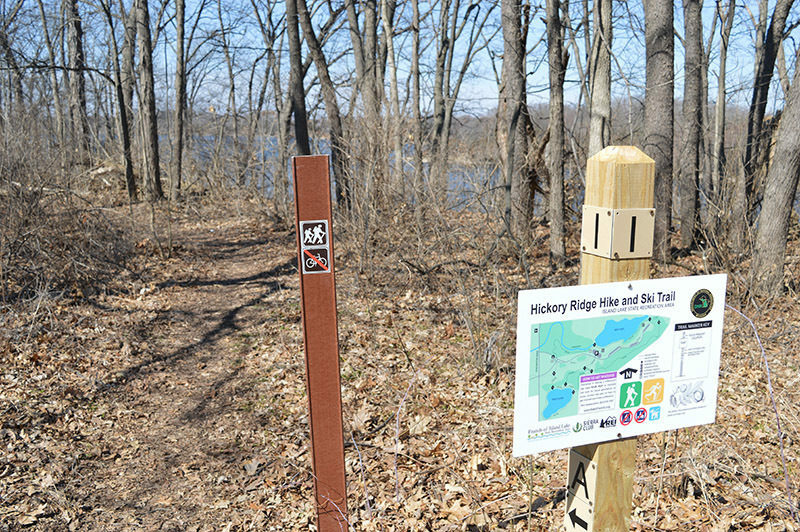 One of the newest trails in Southeast Michigan is Hickory Ridge Trail that opened in 2017 in Island Lake Recreation Area on the east side of Kensington Road. 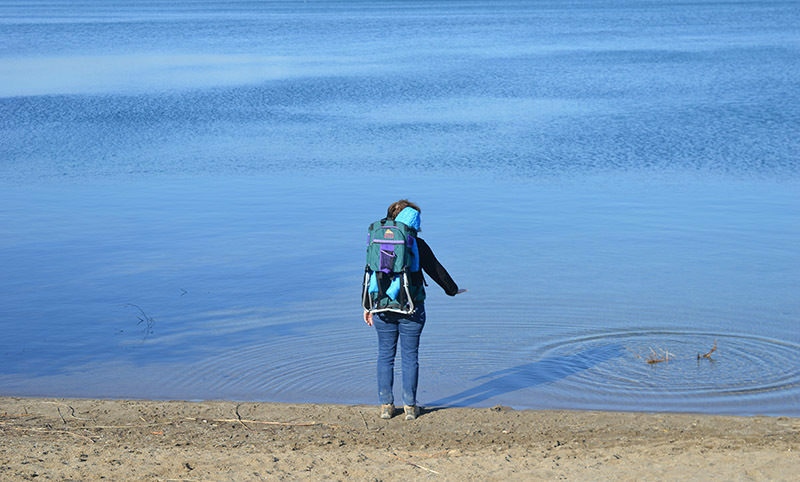 The 6-mile trail system includes three lakes, a portion of the Huron River and some interesting woodlots but most of all it’s for hikers only. Mountain bikes are banned from the trails in a state park that is often overrun by two-wheelers. When the mountain bike craze exploded across Michigan in the late 1980s, one of the places the off-road cyclists showed up at was Island Lake Recreation Area. They never left. The Yellow Trail and Blue Trail, originally designed for hikers, soon became popular mountain bike trails that would attract hundreds of cyclists on the weekends. 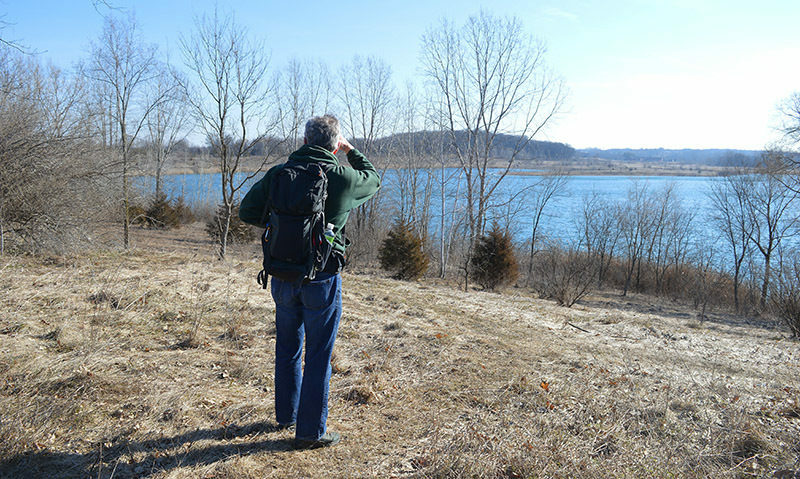 Walkers, hikers and trail runners finally got a portion of the park back when in 2017 the Hickory Ridge Trail was opened on the east side of Kensington Road. 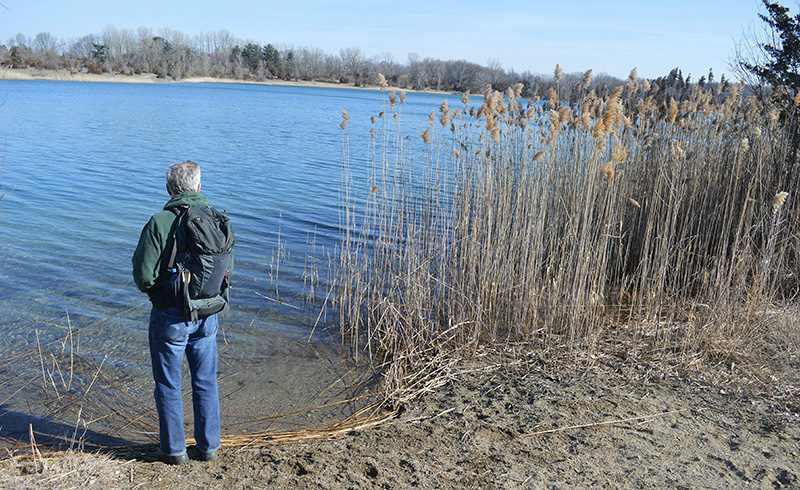 The 6-mile trail system includes three lakes, a portion of the Huron River and some interesting woodlots but most of all it’s for hikers only. Mountain bikes are banned from the trails. Hickory Ridge was a joint project between the Sierra Club, Friends of Island Lake and REI. The trailhead is located in the Kent Lake Dayuse Area and a portion of the trail winds through the picnic grounds. But most of the trail is located in forest, meadows or wrapped along Trout Lake and the Huron River. There is some elevation change, particularly along the Huron River, but overall the trail is an easy outing. The only complaint some hikers have is the sound of target practice you hear from the park’s gun range on the north side of the Huron River. The hike described here is the perimeter of the system, a 5-mile loop. But spurs and crossovers allow for shorter hikes. 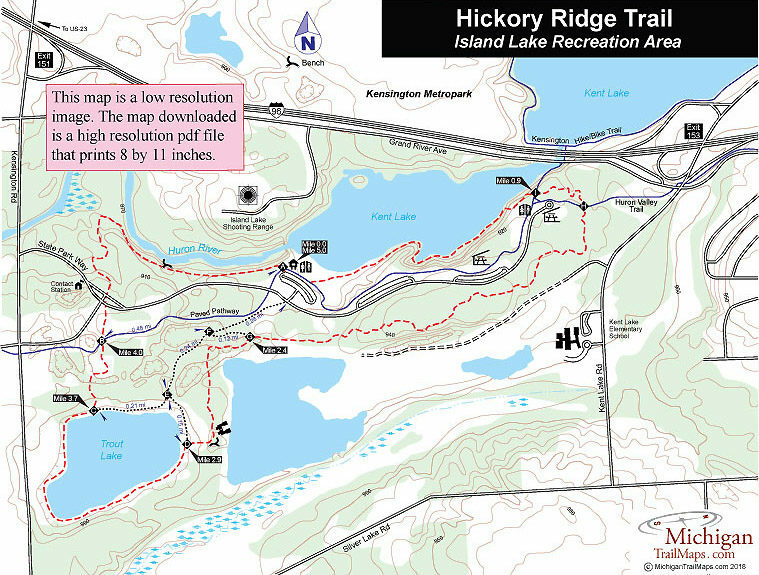 By following the trail from posts A-F-G and then around the Trout Lake before returning along the Huron River, you form a 3-mile loop that includes the best scenery Hickory Ridge has to offer. Post A is located at the west end of the day use area, a short walk from the first main parking area and adjacent to a set of vault toilets. If following the route in a clockwise direction and saving the best for last, heading east the trail can be a bit hard to pick up at first. Just head for Kent Lake as it closely skirts the shoreline in the dayuse area where caution is needed if conditions are wet or icy. Eventually the trail climbs away from the man-made lake and at Mile 0.9 reaches post I. The junction marks the paved path that continues north under I-96 to connect Island Lake with the paved trails in Kensington Metropark. Hickory Ridge heads back into the woods and within a quarter of a mile crosses another paved pathway at post H. This is a spur of the Huron Valley Trail, a 12-mile rail-trail that extends to Lyons Oaks Metropark in one direction and South Lyons in the other. Head right and Hickory Ridge stays in a second growth forest for the most part until it breaks out in open fields and meadows to reach Post G at Mile 2.4. Head left for a stretch of rolling terrain where you can see an unnamed lake to the east, then Trout Lake to the west and at one point both lakes at the same time from the crest of a ridge. From there the trail descends sharply to the shoreline of Trout Lake and the wide gravel path that skirts it. If followed in a clockwise direction, you remain along the water and reach post C at Mile 3.7. Head north (left) at the junction to enter more open fields and cross the park’s paved path at post B and then the park road. On the other side of the road you enter the most interesting stretch of the day. You’ll soon be passing some impressive pines and before the trail swings east and provides your first glimpse of the Huron River from the top of a river bluff. At Mile 4.6 you arrive at a bench positioned with a great view of the sluggish Huron below. You stay in the woods for the final leg of the loop until breaking out at the Kent Lake Dam and dayuse area. At the Kent Lake Dayuse Area there is a seasonal canoe rental concessionaire as well as a canoe launch onto the Huron River for those who bring their own vessel. Other amenities include drinking water, toilets, a swimming beach and beach house, picnic tables, grills and shelters. The trail is open year round and is designed as a cross-country ski area in the winter when there is sufficient snow. An annual Recreation Passport sticker or daily vehicle fee is required to enter into the park. From I-96, just east of US-23, depart at exit 151 and head south on Kensington Road. The park headquarters will quickly be passed on the west side of the road and the entrance to the Kent Lake Dayuse area will be posted on the east side just beyond it. For more information call the Island Lake Recreation Area headquaters (810-229-7067) or check the website of Friends of Island Lake.